The transition from initial drug use to more addicted states is marked by dramatic escalation in drug consumption, and profound increases in drug craving, leading to compulsive drug-seeking behavior in withdrawal. While escalating intake can be viewed as a compensatory response to reward tolerance, or a change in homeostatic set points, increased drug craving may reflect a sensitization process, where the incentive properties of drugs gain motivational salience. In humans, these differential alterations are reflected by self-reports of reduced euphoria despite increases in the amount of drug consumed, but substantially increased wanting or craving and loss of behavioral control in withdrawal, compared to earlier stages of their drug use history. Identifying neurobiological changes that underlie the transition to addiction are important for our ability to understand and ultimately treat the disease. These behavioral changes can be modeled in rodents using variations in the self-administration paradigm in attempts to dissociate "addicted" from "non-addicted" biological states. In these studies, the addicted phenotype is artificially produced by prolonging daily access to drug SA, or selected from outbred populations based on individual differences in preferred levels of drug intake. Importantly, escalating drug intake is accompanied by a propensity for drug-seeking behavior in withdrawal, thereby encompassing both addictive traits in a subpopulation of rodents. The propensity for relapse in withdrawal can be measured using the extinction/reinstatement paradigm. In this paradigm, addiction-related enhancement in relapse behaviors is reflected by greater drug-seeking responses triggered by environmental and pharmacological stimuli after withdrawal from chronic drug self-administration. The major goal of Project 4 is to identify critical neuroadaptations to chronic drug self-administration that functionally contribute to addiction-related increases in these drug-taking and -seeking behaviors. We focus on a series of neuroadaptations, explored at more molecular-cellular levels in the other Projects, which we have shown are critical determinants of addiction: the transcription factor CREB and the neurotrophic factor BDNF (brain-derived neurotrophic factor) and their signaling pathways. 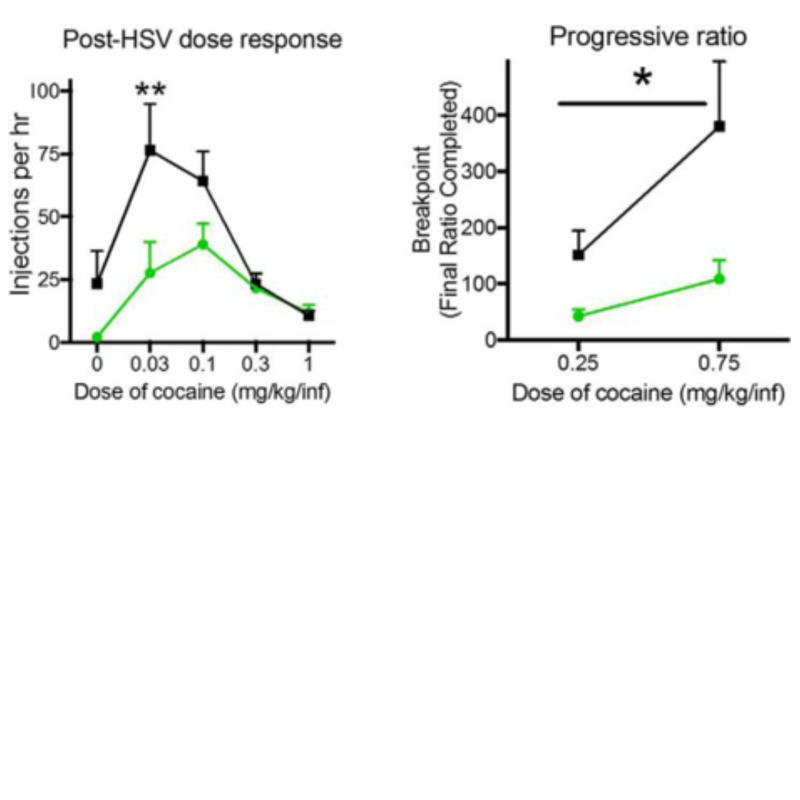 (Right) The effect of overexpressing G9a (a repressive histone methyltransferase under investigation in Project 1) in NAc on cocaine self-administration behavior in rats. From Anderson et al., J Neurosci, 2018.